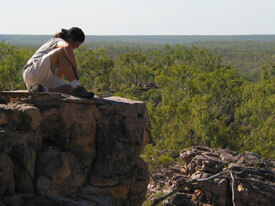 Sick of the bus-tourist track, truk and kath went bush. And almost bushfire. 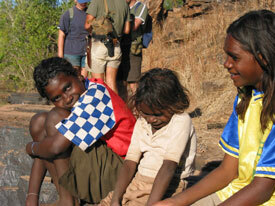 On a suggestion of an unusually clued-in YHA tour booking person, we headed off to central Arnhem Land for a unique opportunity to travel onto Aboriginal land and learn a little about the modern indigenous culture and lifestyle in the region. 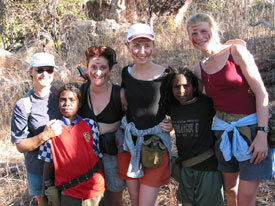 Arnhem Land is a very difficult place to visit. Currently, only 15 tourist vehicles are allowed to be in the area, which is only slightly smaller than the size of Texas. 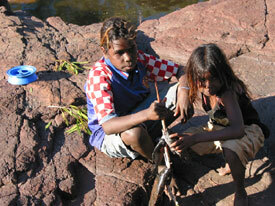 Most of the land is Aboriginal land and is still held by communities comprised of traditional owners. 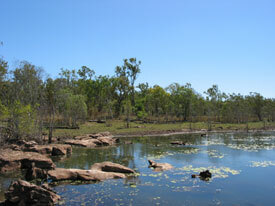 You need a permit even to enter the place, unless you are travelling with a person that already has the permission of the traditional owners (T/Os). 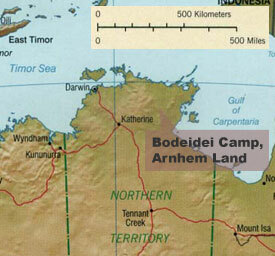 Bodeidei Camp (Google English translation) is near Weemol, an Aboriginal Community in Central Arnhem Land (Bulman a cattle-station community is probably the largest, recognizable place around). 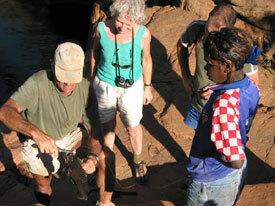 The tour operator, Francois (of Dreamtime Safaris), has lived in the area for over a decade and runs his camp with the support and cooperation of the local community. 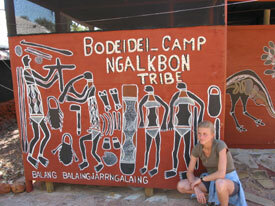 The experience at Bodeidei primarily attracts European tourists and specializes in introducing visitors to indigenous culture, people, and places. 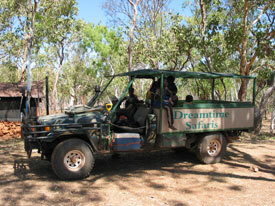 This is the vehicle we used to get in and out of Arnhem Land. This thing is a beast, probably the most formidable non-military vehicle we have ever ridden in. The Bodeidei Camp was hand built by Francois and is very luxurious by bush standards - hot water showers, flushing toilets, mosquito net covered beds, electricity, and a dining room. Here, kath is hanging out in front of our tent. Francois had to transport all of the stone from many kilometers away in order to build all of the shelter bottoms and the walkways. 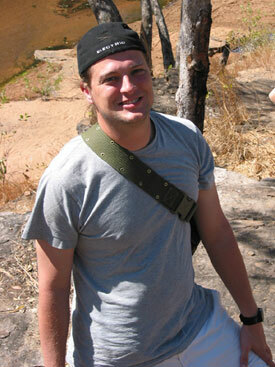 Basically, all of the building materials were actually found or manufactured nearby. 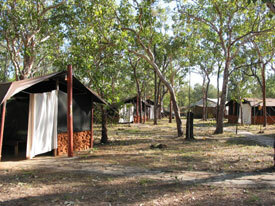 One of the Bodeidei camp showers. 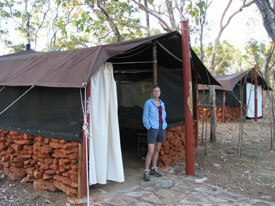 Every night, after being out all day on safari, we would come back to a hot shower, thanks to the fire-heated hot water tanks next to the showers. You had to shower with a buddy, because someone had to stand outside near the hot water tank and set the water temperature while you yelled instructions. 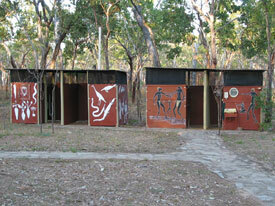 The Bodeidei camp toilets. Flushing toilets. 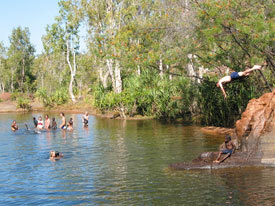 In the middle of Arnhem Land. Imagine hopping off of your camel in the middle of the Sahara and finding a free broadband Internet connection at the nearest oasis, and you will have to general idea of how strange this is. 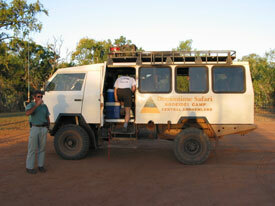 During the day, we took this excellent safari truck out to see billabongs (water holes), the local Aboriginal communities, and wildlife. 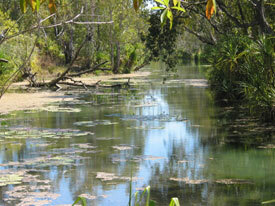 The first billabong that we visited, which was full of birds, dozens of different varieties. 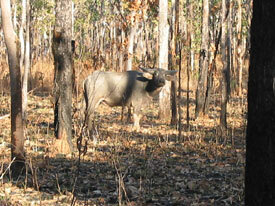 A buffalo, a staple food in this corner of the world and a sight to see as we bumped along the 4WD roads. 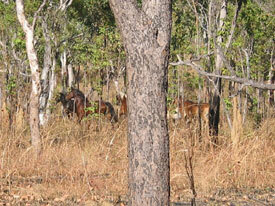 Brumbees (wild horses) live and thrive in the Dry. 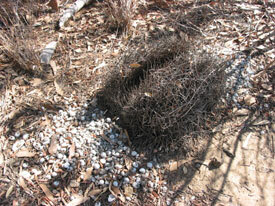 This is a strange bird nest, where the bird makes a little stick structure and goes through a process of moving white shells from one side of the nest to the other during the mating process. 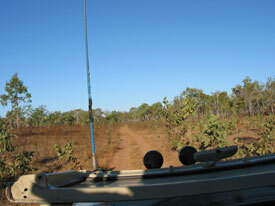 The view out of the front of the safari truck. 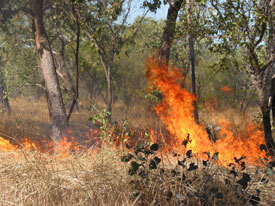 Bushfires are very important for clearing off dead ground clutter and helping new life spring from the land. 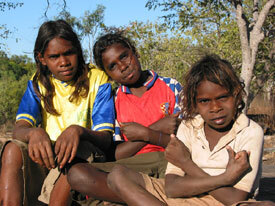 Traditionally, Aboriginal people saw it as part of their stewardship and responsibility to care for the land by burning it. With this fire, Francois demonstrated how quickly the dead grass could burn. 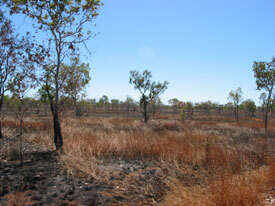 After the fire, the land looks scarred and disfigured. However, the trees and other plants have developed a resistance to the fire, with very tough or thick bark that was designed to take the brunt of the fire while protecting the rest of the plant. 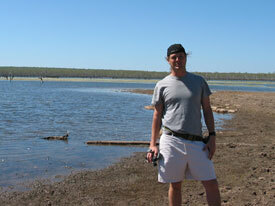 And, in the end, this area will spring to life when the rains begin again later in the year. 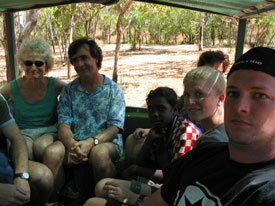 In the front seat of the safari truck. Francois is driving, and Junior is sitting behind truk, waiting to cry "Buffalo" every few minutes (even if there are no buffaloes nearby). 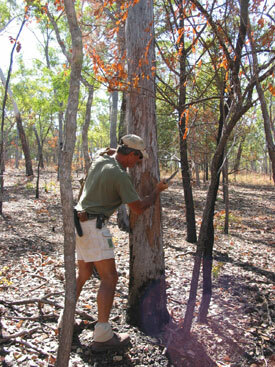 Francois is chipping off some bark from a tree after a bushfire swept through this area. 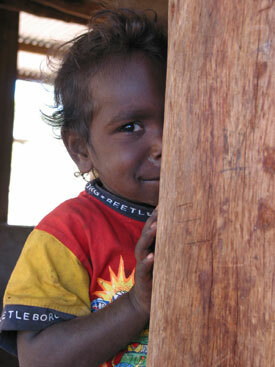 truk in a thoughtful pose, looking down on the river below near Dalangarr, an outstation about 30k away from Weemol. 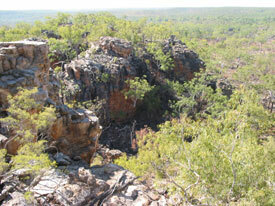 The stone escarpments in Arnhem Land are raw, scraped rock, aged and burnt by sun and fire for generations. 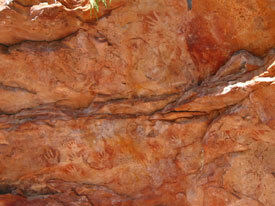 These Aboriginal hand paintings were on a stone face less than a kilometer from a modern Aboriginal outstation. Most likely, these paintings are at least several thousand years old. 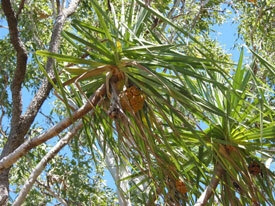 A palm with fruit that you can cook, smash, and eat. Bellamina and Alexandra mixed up some red ochre and painted the women's faces. Here we are all painted up... brings a whole new meaning to the old adage, "to put your face on..."
truk, strapped with a canteen, smiles for the camera, as kath takes her first digital photo. 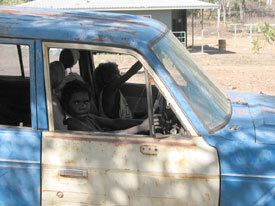 Junior and Kelly imagine all the places they'll go in this old car on the grounds of the outstation. Karina flirts with the camera. 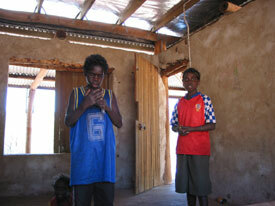 Junior and Bellamina in one of the buildings on the outstation. Here we were, literally hundreds of miles from a CD shop, and the words "Eminem" and "NWA" were scrawled on the wooden shutters of this shack under construction. 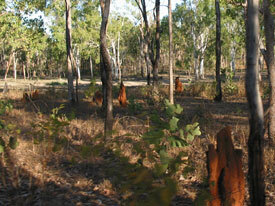 The termite mounds in Arnhem Land are smaller than in Kakadu and Litchfield, and they show the brilliant red clay soil of the land, especially during sunrise or sunset. 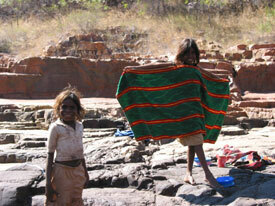 Here we are setting out for an afternoon of hiking and swimming near Klikliamarra. 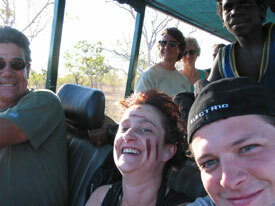 Anne and Pierre smile as we bump along in the 4WD safari truck. Serina and Alexandra get ready to go for a swim. Rabbitohs fans will appreciate Alexandra's choice of towels. 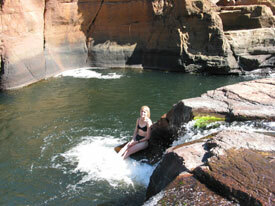 kath sits at the foot of a small waterfall, testing out the temperature and getting ready for a swim. Everyone swims while Stefan dives off the rocks. Alexandra and Bellamina pose for kath. 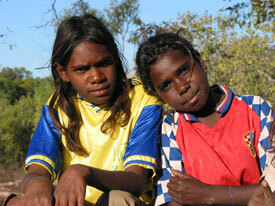 They enjoyed getting to see the digital images of themselves just after they were taken. 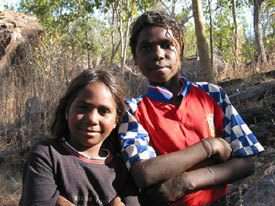 Roberta and Bellamina, tough, beautiful, and clever young women. Bellamina, Serina, and Roberta, a moment of shyness in front of the camera. Roberta, Bellamina, and Serina - gang signs have even made it to Central Arnhem Land... ahh globlalization (I mean, satellite TV). Bellamina, the fishing queen, hooked dinner and Francois demonstrates a technique for stinging the fish together using a stick with a "y" at the end. Alexandra puts one of the day's catch on the line. 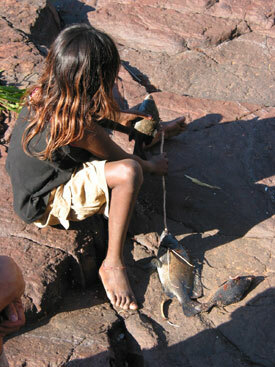 Bellamina and Alexandra hold up their catch, getting ready to carry it back to the jeep. 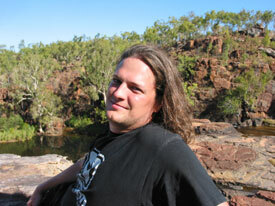 truk, taking a rest after a refreshing swim. Note: To view the video footage, you must have the QuickTime Viewer application installed on your computer and the QuickTime plug-in properly installed with your web browser. To download QuickTime, go to http://www.apple.com/quicktime/download.